Christmas is a one of the most exciting times of a child’s life, and it also a season that gives many parents a warm feeling that brings back childhood memories of Christmas. This probably includes growing up listening to the sound of trains clacking on their tracks or the train-whistle blowing in the middle of the night. A Christmas tree train model set contributed a lot in our childhood and could contribute more with the memories of our children. Christmas tree train sets offer a lot and can form a core part of your Christmas tree decorating. 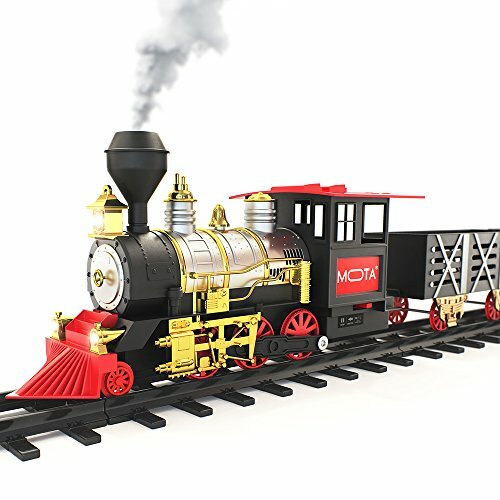 These train sets bring another dimension of excitement to the Christmas tree and also give you a chance to bond with your kids during the festive season as you bring together the various trains and accessories to create your very own unique setting for the Christmas tree. There are numerous options available on the market and your choices depend on how much you are willing to spend, the size of the tree, and the age of your kids so you can have something that excites and fascinates them. The Christmas Santa Holiday Classic Train is a battery powered locomotive that makes authentic sounds and hauls cargo cars around an easy-to-build track while blowing real smoke – lending a touch of reality to the miniature train experience. This train hauls three cargo cars around the customizable track making every train ride a different experience and encouraging creativity. The train runs on a track that consists of 12 curved and 4 straight sections. This set has 20 pieces and requires batteries which are sold separately. The Christmas Santa Holiday Classic Train set is available at Amazon.com and includes free shipping. The smoke can be a little irritating if not in a well aired room – use sparingly! Overall for what the train delivers it’s a nice set that is bound to put a smile on the faces of young children. The features and combined with the excitement it creates in the hearts of the adults and kids alike justify the price. This is a good buy. This train set can also be a great train toy for kids. It is fairly large, lengthy and fully packed with features such as light, sound and smoke. The Lionel Polar Express Remote Train Set—O-Gauge comes with an all new TrainChief Remote Control system, which makes it very easy to run. This train set for Christmas tree allows you to run more than one locomotive on the same track. The remote has the ability to send out distinct frequencies for different LionChief locomotives which allows multiple engines to run simultaneously. The set is available at Amazon.com and includes free shipping. The remote features a forward and reverse speed control knob and buttons to activate the whistle and bell sounds. The set includes eight pieces of O36 curved FasTrack, one piece of straight FasTrack, and one straight terminal section. Suitable for multiple age groups. Includes four character figures from The Polar Express. This train set is among the best train sets available on the market today. 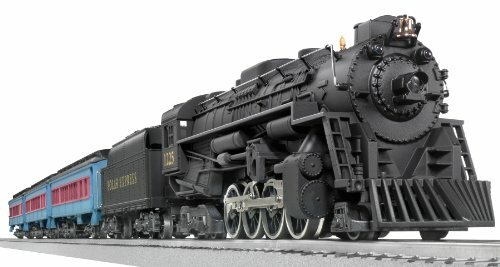 It can be purchased with the kids in mind and the adult model-train lover, making it a good purchase for anyone. You can buy this durable set and use it during Christmas and the rest of the year. This train set is a G-scale train that features a radio control locomotive and runs over 25 feet of track. The train is capable of forward and reverse motion while producing electronic train sounds and playing Christmas carols. This set is battery-operated with a skating carol car that has an animated elf. It has one 90-Degree crossing track for making a Figure 8 layout. 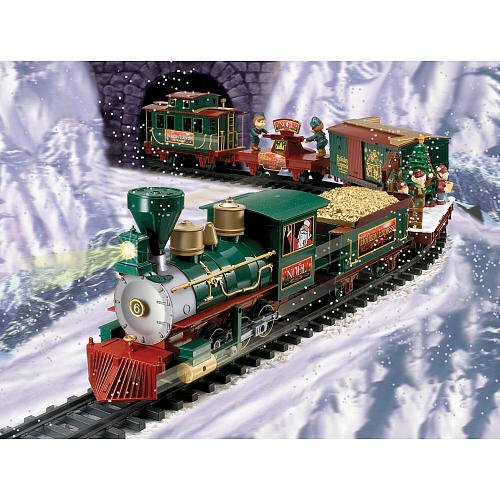 The Ez Tec 37260 North Pole Express Christmas Train Set is available at Amazon.com and includes free shipping.. Requires extra care to avoid damage as it’s not very sturdy. Consider replacing the track from this set with other G-gauge track that is more durable. Overall this is a good train set for Christmas tree that delivers a good train experience though you might need to ensure extra care. Rough handling might damage the set. However, this is not to say that this train is of poor quality in any way. It is a quality product that would be a good investment and one that the kids would enjoy. When it comes to the best Christmas tree train set, the Lionel Polar Express O-Gauge Remote Set is your best choice. However, there is the issue of the cost if you are on a budget as it does not exactly come cheap. The option of the Christmas Santa Holiday Classic Train by MOTA is a budget train that delivers decent performance and smiles on the faces of the children. The Ez Tec 37260 North Pole Express is a good bet for a mid-budget Christmas train set. Whichever set you choose, you are guaranteed a quality set and loads of fun.